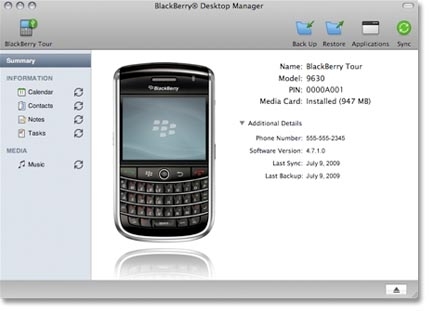 BlackBerry Desktop Software for the users of Mac OS X helps to sync BlackBerry smartphone with Mac computer simply and easily. Whether it's a specific iTunes playlist or a random mix of tunes, it's easy to sync the music from your Mac computer to your BlackBerry smartphone. Transfer data between BlackBerry smartphones, back up and restore information manually or automatically, and add or remove applications.